The BLT. Photo by Donna Turner Ruhlman. Last week, while I stood by my Big Green Egg, smoking a big fat pork belly (for bacon) and two fat beef briskets (for pastrami), I couldn’t help but think how am I going to eat this delicious food? It was a warm, sunny day and I could actually smell the tomato vines behind me, so I thought, bacon and tomato, mmm. Then I remembered the wonderful BLT from Scratch challenge, and the inspirational response to it. Hard to believe it was three years ago. Here it is again, and I assure you, there is no finer sandwich than one that takes months to prepare! Here’s the link to the winners. The above, with that fabulous home-cured slab of bacon, was one of the best of my life. I don’t think I’ve had more fun making a sandwich than for the BLT-from-Scratch Challenge. And it wasn’t the from-scratch part. I do this stuff all the time—the from-scratch fun was sharing it with so many people and hearing your stories. That I don’t do all the time. But the coolest part of this cooking challenge was how amazing the sandwich turned out to be. I received dozens of entries in all forms, classic, reinterpreted, vegetarian. Every one of them inspiring. Donna will be reviewing all the photographs this week to choose this winner. I will be determining the winners of “best overall,” “best vegetarian or vegan,” and “best reinterpretation.” All winners will be announced next Monday. These BLTs were some of the most meaty, delicious sandwiches I’ve ever eaten. With the mayo, the explosively juicy tomatoes still warm from the sun, thick succulent tender slabs of cured pork belly—these were BLTs times ten times ten. Pork fat, tomato juices, and mayo dripping down the chin. They were so good and so surprising, had I served one to you, you might not have known you were even eating a BLT. The key here is that the sandwiches featured the pork belly—the meat was thicker than the bread. This is really a pork belly sandwich, garnished with L, T, and mayo. Here’s the critical cooking point for using bacon this thick in a sandwich. If you were simply to cook the bacon in a pan, it would be difficult to make it tender enough to eat without yanking it all out of the sandwich. Belly is a well-worked muscle that needs tenderizing. Traditional bacon is tender because it’s sliced so thin. The way to make slabs of bacon tender is through long gentle moist cooking. I wrapped the slabs in foil, drizzling a little water over them to make sure it would be steamy inside the foil, and cooked them in a 200° oven for 3 or 4 hours. I let them cool and reheated them to make the sandwich. Some I reheated on the grill over hot coals to get some smokiness, some I sauteed in a pan. The belly in the sandwich shown here (n.b. I did not grow the potatoes or harvest the salt for the chips), I braised till tender, then fried. Slow-cooking, cooling, and reheating is a fabulous way to serve belly. I want to do one more BLT from scratch, featuring not the belly, but the tomato—a green tomato sandwich garnished with strips of bacon, lettuce, and a spicy mayo. I may even dredge the tomato in cornmeal as opposed to my preferred panko. It turns out the BLT-from-Scratch Challenge has been just as much a thought experiment as a cooking challenge. And for me that’s some of the funnest cooking there is. My posts on essential parts of the BLT: Bacon, Mayo, and Bread. Find my bacon recipes in Twenty and in Charcuterie. Lots of classic sandwiches, but here is a list of new sandwiches for 2012. How about using bacon jam for your bacon component of the BLT? OMG – I don’t make charcuterie from scratch & would die for some of this. How do I befriend someone who makes pork belly or do trade for my homemade baked goods or chutney? 1. Jowl bacon. Surprisingly different than belly – the fat is softer and renders at a lower temperature which prevents burning of the high sugar content I like to use in my cure. 2. Kellogg’s Breakfast tomato. This meaty orange beefsteak has become our go-to for the BLT. Will plant it in the garden every year. 3. California avocado. Ok, it doesn’t have to be from California but its hard to imagine a BLT without the creamy goodness of avocado. 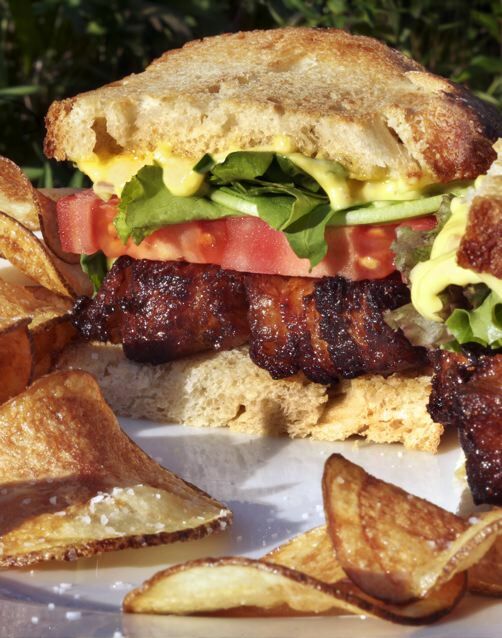 We’ve used homemade and store bought variations of bread, mayo, and lettuce but the above three things have really made for some good BLTs this year. i love avocado on just about anything. So Ruhlman, we were at the north union farmer’s market earlier this summer (before our tomatoes had matured) and stopped by a booth with the most beautiful variety tomatoes. We bought a bunch and stopped by On the Rise on the way home. I remembered your post on making mayo, so we whipped up some mayonnaise and had the most beautiful tomato sandwiches I’ve ever encountered. I successfully made a delicious mayo on my first try…thanks for that knowledge. I like to skip the mayo but briefly marinade the tomato slices in some olive with a little vinegar and a chiffonade of basil.